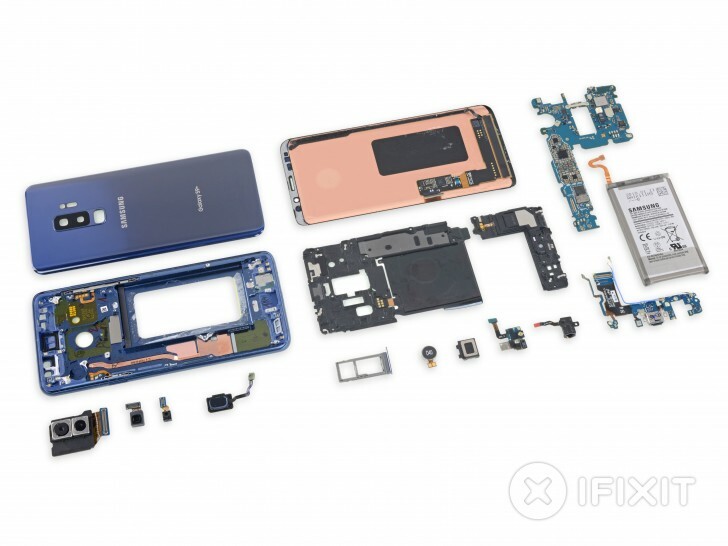 It's the Samsung Galaxy S9+'s time to get the iFixit disassembly treatment and for us to have a good look inside its beautiful glass and metal hull. The teardown starts off like you'd expect for a waterproof glass and metal phone - with a heatgun, opening pick and a lot of nervous prying. The battery is glued in place and required Adhesive Remover and a lot of know-how to remove. The camera is the more interesting component. Being the Galaxy S9+ it's the dual camera with the main variable aperture sensor and the second, tele sensor. The main camera's aperture is made up of two rotating circular blades that adjust between the wide f/1.5 and the narrower f/2.4 one. The conclusion, as with so many modern flagships, is that you'd best leave repairs to certified repair shops and professionals. The screen is very difficult to replace because you'd need to disassemble the rear glass panel. Check out the complete guide over at iFixit's website. Actually, this website is read from countries around the world and not in every county we have all those wonderful benefits.